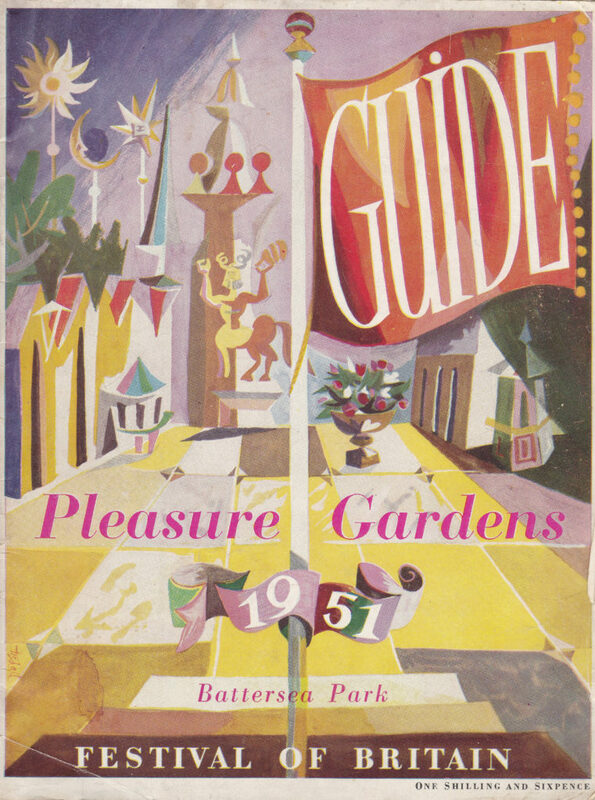 The cover page of the Pleasure Gardens guide was different from the other more formal official guidebooks. This was to highlight the more entertaining experience that the visitor would have compared with other events such as on the South Bank. 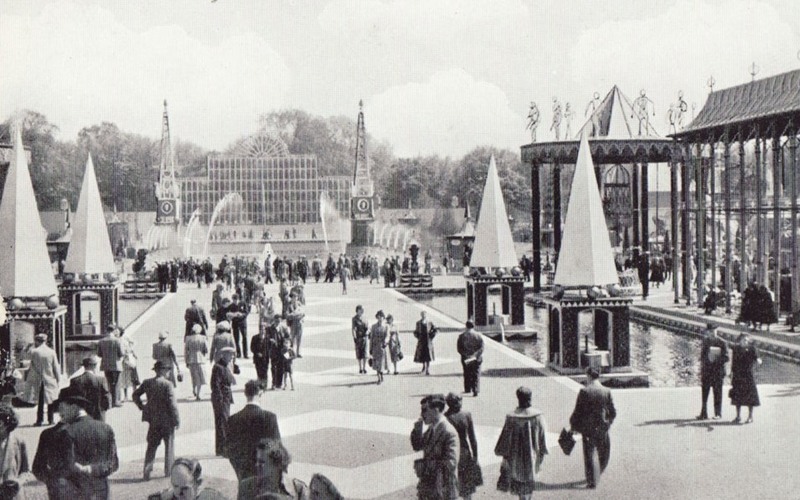 The main area of the Festival Pleasure Gardens was the Grand Vista at the western end of the park with a view of towers and arcades, lakes and fountains. At the eastern end was a large funfair or amusement park. Along the southern edge ran a whimsical pleasure railway between the festival gardens stations of Oyster Creek and Far Tottering, and the northern side was bounded by the riverside with a pier where boats docked bringing visitors from the South Bank. Once again there was opposition from Lord Beaverbrook’s press and Conservative MPs at the money being spent given all the other places crying out for financial aid. 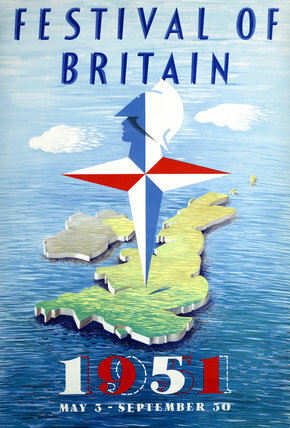 In the years leading up to 1951 the project became something of a political football. It was shelved for a year, but then given the green light but with only half the budget that had been originally allocated. 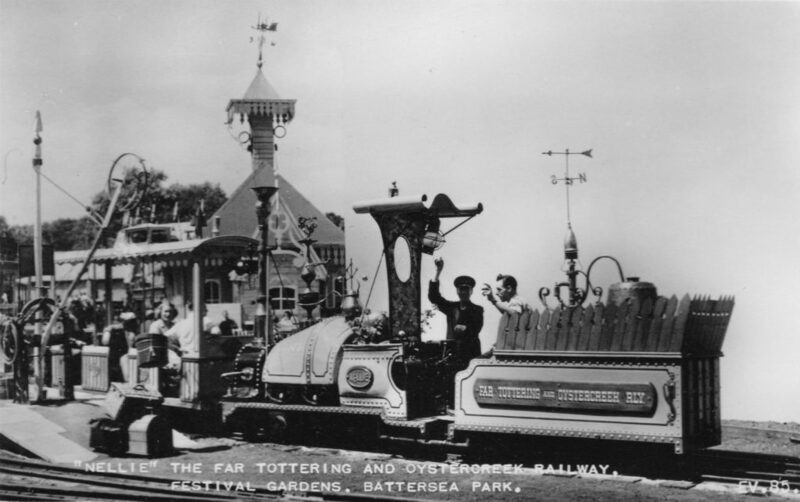 This resulted in many of the attractions at Battersea having to be sponsored. The Grand Vista at the Festival Pleasure Gardens, designed by John Piper and Osbert Lancaster, was intended to emulate on a small scale the visual effects seen in the parks surrounding English country houses, or within the grounds of Versailles. On payment on two shillings at the gates that led into Battersea Park, the Festival Pleasure Gardens offered endless attractions. As well as numerous restaurants and cafes and three beer gardens, named after the original London pleasure gardens, there was the Guinness Festival Clock, the Schweppes Grotto, the Tree Walk, the Children’s Zoo and Aviary, Peter Pan’s Railway, Nestle’s Playland, a Punch and Judy Theatre, the Fountain Lake, the Mermaid Fountain, the Dance Pavilion, the Music Pavilion, and the Riverside Theatre. The Guinness Clock. Every fifteen minutes the crowds were spellbound by the four and a half minute routine featuring well-known characters from Guinness advertising. The 25 foot high clock was designed by the firm of Lewitt Him and took five months for clockmakers Baume and Co Ltd of Hatton Garden to construct. There were fireworks in the evening launched from a platform at the end of the Grand Vista. There were retailers as well: ‘Nell Gwynn girls’ selling Outspan oranges or a presentation of ‘Festival Fashions’ by Cooks of St Paul’s opened by the actress Janette Scott. To guarantee the crowds, spectacular fairground attractions were needed, and that meant getting them from the USA. 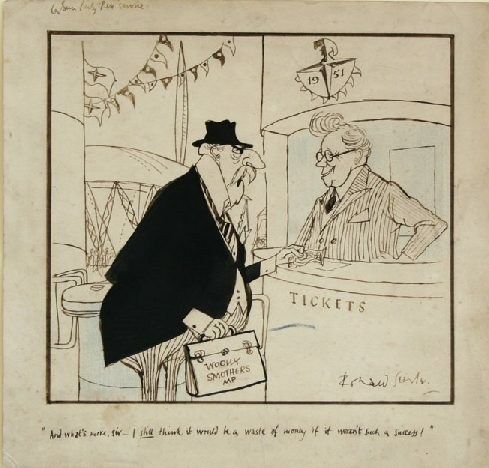 Astonishingly, in 1950 the Festival Committee obtained £30,000 from the Treasury for the purpose, and a trip was made to America to acquire the latest amusements. Unsurprisingly the trip was kept ’very hush hush’. But the press found out. Questions were raised in Parliament and the Daily Mail ran critical headlines about the spending of thousands of dollars on a funfair roundabout. As a result of the visit, the Festival Gardens ended up with some of the latest American funfair rides. The names of the rides give a good idea, well mostly, of what to expect: Octopus, The Whip, Dragon Ride, The Wall of Death, Lighthouse Slip, Leaping Lena, Dodgems, Caterpillar, Waltzer, Moon Rocket, Big Dipper, Ghost Train, Bubble Bounce, Hurricane, Fly-o-Plane, Rotor, Boomerang, Flying Cars, Sky Wheel and three-abreast Gallopers or carousels. These rides were not all open at the same time. New rides opened, and old rides were replaced as visitors lost interest, or because the ride was too costly to maintain. There was also the Haunted Mirror Maze and the Crazy Cottage, as well as a boating pool with a Cornish village backdrop at one end, and the Cremorne beer garden on two other sides. The project had started eighteen months late due to the funding difficulties, and together with construction problems, there was little chance of opening on time on 3 May 1951. Instead of a Venetian pavement with steps going down to the main lake an undulating mass of tarmac had been laid. Some showmen had rides and other attractions ready to open and they threatened to light up for business on 3 May. In the event, the amusement park, albeit hastily fenced off from the rest of the incomplete gardens, opened its gates to invited guests on May 10 and to the public a day later. The Gardens opened a few weeks after at the end of the month. As the Caterpillar speeded up, a green cover would rise up from the side of the car, and descend over the seats so that it was dark inside. As the Caterpillar went faster and faster, the occupants would be jerked and jolted as the car moved up and down over the track. It had been intended that after the end of the Festival in October 1951, the Pleasure Gardens would stay open for three years. Unfortunately 1952 saw a huge drop in visitor revenue, and despite a cut in admission prices 1953 was even less successful. 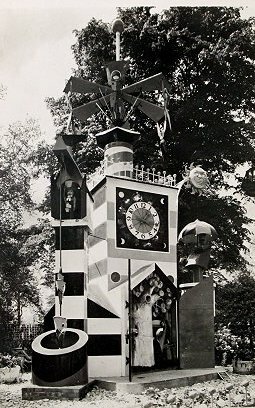 The Pleasure Gardens were closed, Battersea Park was reinstated though a few features such as the Guinness Clock and the Tree Walk remained into the 60s and 70s. The amusement park was only supposed to operate for six months but was such a success that it re-opened for business the following year. At the end of the 1953 season a private company took over, and operated the park for the next twenty years. Following a tragic incident on the Big Dipper rollercoaster in May 1972 when five children were killed, the rollercoaster was closed. The loss of the funfair’s main attraction led to the decline in its popularity, and its eventual closure in 1974. The site was then levelled. From 2002 to 2004, Wandsworth Borough Council carried out a £11m restoration of the park, funded in part by a substantial Heritage Lottery Fund grant, which allowed many of the remaining features of the Festival Pleasure Gardens to be incorporated into the design of the original mid-nineteenth century park. This website compares many of the locations around the Pleasure Gardens with how the park looks today, evoking the designs from 1951. The Far Tottering and Oyster Creek Railway began in a series of cartoons in Punch magazine in 1939 created by Rowland Emett and which came to life in the third of a mile long 15″ gauge railway in the Festival Pleasure Gardens. Three diesel-electric locomotives were built each with fanciful mechanics, Nellie, shown here, Neptune and Wild Goose. 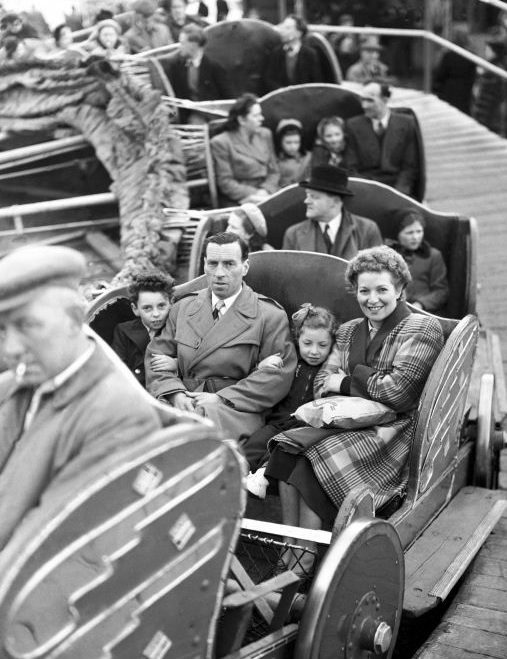 I visited the Pleasure Gardens with my family, though it was probably not in 1951 as I was only five. 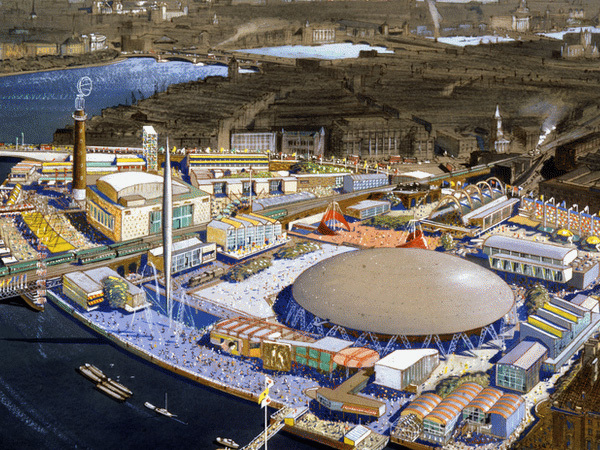 It could have been 1953 when all the attractions, as well as the funfair, were still open. I was amazed by the Guinness Festival Clock, and fascinated with the Oyster Creek and Far Tottering railway. I remember going on the elevated Tree Walk, 30ft above the ground, and into the Mirror Maze and the lopsided Crazy Cottage, viewing the Wall of Death motorcycle riders, and going on the Caterpillar, with the scary green covers unfurling and coming down over me as I whizzed round and round. I likely went on some of the other less scary rides but not the huge Rotor. I was told that visitors entered halfway up a huge drum. They stood against the walls and the ride started to rotate. When it had reached a certain speed the floor would drop away leaving riders stuck to the wall. Even today it stills sounds a bit terrifying. 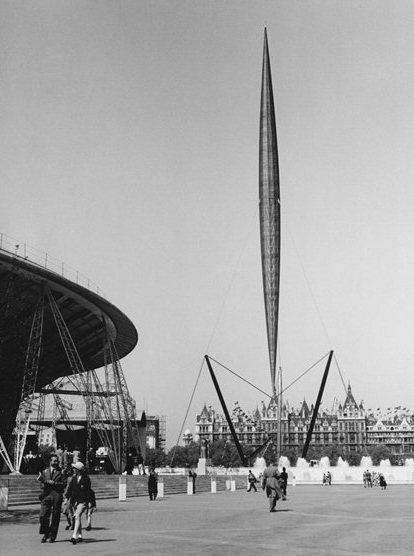 Over eight million people came to the Festival Pleasure Gardens between May and the final day on 3 November 1951, two million more than expected. At the final firework display, Herbert Morrison, the Labour minister who had been the enthusiastic leader of the Festival of Britain project, and who had been hailed as ‘Lord Festival’, said to the crowd, ‘you seem to have been enjoying yourselves’. There was never any doubt.